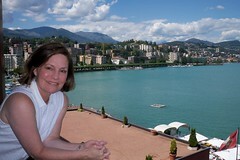 Lugano, Switzerland is gorgeous! The homes are nestled in the mountains and along the shore of Lake Lugano. The water is a beautiful blue-green and the air is crisp. There is even a little snow left on the mountains, the Alps. I walked the length of the lake and back to our hotel. There were lots of people walking their pets, strolling along, eating gellato, sitting on park benches, and relaxing. I could get used to living here! Lake Como tomorrow. Ciao! If you get drafted, just don't leave... haha. I want to see a blog post about eating lunch with Bono in Milan. Sounds really nice there. I think you are a mountain person. Ha, ha. I didn't exactly eat lunch with Bono. It was really cool hearing the people chant and cheer. It sounded just like a soccer/futball game. The waiter left our restaurant to see what was happening, that's how we know. And how exactly did he get from Michael Jackson's funeral to Milan in time to do a show that night? I am totally a mountain person, no doubt about that. I have had a lemon gellato, and it was fabulous. Last night I had goose liver pate stuffed zucchini flowers with truffles. How is that for trying different foods? Goose liver pate stuffed zucchini flowers with truffles sounds amazing. What did you think? Bono and I are great buds, now. George Clooney, too. I stopped by his villa at Lake Como today. Stopped by the villa of Richard Branson, the owner of Virgin Records, also. The goodse liver pate stuffed zucchini flowers with truffles was fantastic. I have never had anything like them. It is hard typing on a Swiss/Italian keyboard. They do not have an apostrophe key and several other keys are switched.